I wrote every line of PHP and CSS in 11 files that make it work. I had to custom write the search.php file because my “if” statement on the sidebars was conflicting with other logic. That was 6 weeks of work. And I took about 4 days off during that entire time. So I’m a little burned out on computers right now. It’s cool to learn new stuff, and I’m lucky to be working less than half time this quarter so I could study, and then apply my new knowledge to a nice project. Plus I was studying ecommerce, and building lesson plans for the new class I’m teaching, all at the same time. It’s really nice to have that in the bag finally. I plan to build on that, but I have to take a break to do some grading now. In other news, an old friend of mine died in a car accident recently. We used to play volleyball together on the company team. Cars are so darn dangerous. People think climbing is dangerous, but I think cars are much scarier than climbing. Now that I have a little free time I’ve started a new self portrait. Getting going was like pulling teeth, but now I can’t wait to get back to the chair and the mirror. 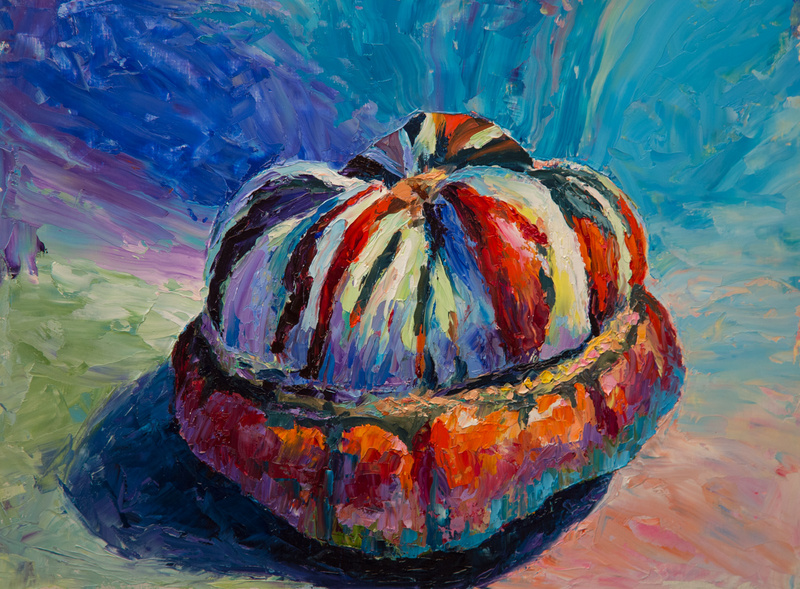 Maybe after I get this grading done later today… I want it to be all crazy colors, like my last palette knife turban squash. I should be able to use that color scheme on my portrait. Skin is orange, like the squash…and I feel a need to throw some paint around. I’ve skied Mazama Ridge twice with my daughter and Sue on my days off. That thing is such a grind when you include the return trip up the road. But the runs on top are very nice. Both times there were no tracks, and we had to break trail the whole way. Navigating up there is super fun. You never know exactly where you are, especially in a whiteout, so popping out on the lake, with a clear trail home is a thrill. Off to work. I’ve been studying WordPress since January. First I got my cart running. It’s actually live and there is now an SSL certificate in place. This means you can use your credit card or paypal to purchase my paintings. I left the “you can’t buy, it’s in testing mode” banner up since I’m still not happy with the shipping functionality. However, you can actually buy a painting, everything works. And if it doesn’t, send me an email and I will fix it. I will try to add in a coupon for free shipping. This way, if you know me and live nearby, like Seattle, I can drive halfway with the painting and save us both the headache of shipping. But before I do the coupon I have to focus on my next lesson plan. I’ve gotten very deep into creating a custom wordpress theme. I’m converting a static html page over to a theme. I have it working already, but it needs a lot of work to be called done. This is one of a series of ten tutorials I’ve working through. But when it does work, it’s very cool. I’ve always liked that about web design. If you do it right, there is an instant feedback. I do feel bad about not painting. 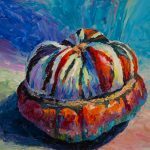 My last painting was at Thanksgiving. But it doesn’t matter. It’s fun learning new stuff for my job, and the painting can wait until I have some free time. Today I got a plain manila envelope from the California State Highway Patrol. I panicked and searched my mind desperately for the last illegal thing I did in California. There was that illegal lane change in Joshua Tree, 6 years ago. Could it be a traffic court summons? I gingerly pried open the tape and found a musty old leather wallet inside with paisley patterns on the lining. I realized with a shock it was a wallet I lost in 1972 on a hitchhiking trip near Big Sur. I can just barely remember standing in a long line of hippies on the side of the road. We all had our thumbs out hoping to be interesting enough for a ride up the coast. I was coming home from a month long hitching trip to see a girlfriend in Frisco. I remember looking for my wallet. Talk about a trip down memory lane. There was my moldy original social security card, My drivers license card, look at that haircut! Plus a couple of rolling papers, now what could those have been for? And a lot of old miscellaneous receipts and notes about people who had given me rid es or hospitality on the road. There was even an REI membership refund for 3 dollars. There were a bunch of phone numbers of friends long lost in the mists of time. I couldn’t help wondering what was going through the minds of the clerk at the Highway Patrol who finally decided to go to the trouble of finding my current address and returning my long lost wallet 28 years later. But hey, thank guys! NOTE: this is an excerpt from an old online journal I’ve had since 1997. You can email me if you’d like to read more from those days. It’s in a hidden directory at the request of one of my old deans. I was asked to teach WordPress last summer, and then low enrollment canceled the class. This Winter it was offered again and it ran. I’ve been using WordPress since 2011, but never delved that deeply into it. It’s been fun diving into it and learning all the intricacies of the application. I learned most of the new stuff about the shopping cart here at Lynda.com. This guy does a great job of explaining it. I haven’t bought the SSL certificate for the store yet, so you can’t use your credit card to make a purchase, however, the paypal function may be live…I’m actually not sure. I just launched on February 4, 2017 and I’ve not done any testing. I do definitely have the paintings, and those are the prices unframed.